Seeing how Eric Beetner is one hell of a prolific author, it is a bit tough to keep up with all his new books. But that’s okay right now, because I find myself in the enviable position of being able to read The Backlist and soon thereafter, jump into its sequel. Both this offering and its sequel are coauthored with Frank Zafiro, who is a new author to me. Some authors just seem to have a knack…no matter what book you pick up from their library you recognize that their books are always fun to read, the books flow with a natural pace, the characters come to life, and the reader always feels satisfied. Beetner is one such author and I was anticipating this being a worthwhile read and it sure was. 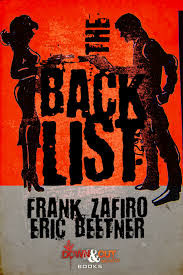 The Backlist, coauthored with Frank Zafiro, has alternating chapters, narrated by two hitmen; Bricks, a woman who finds herself fighting for a spot in a man’s world, and Cam, a hitman who can’t seem to keep a simple job simple. The two hitmen find themselves each taking orders that are simple…eliminate some loose ends for their handlers, or find themselves eliminated. Knowing they must keep their handlers happy to keep their jobs, and maybe their lives, each are put to the test. But when their handlers push them into jobs that set them on a collision course, they need to determine if a friend can really be an enemy, does it stand to reason that an enemy can be a friend? I thought the alternating chapters were seamless and I was left wondering who wrote which parts. But in the end it doesn’t matter because the book was a fun, engaging read that begs for a sequel…isn’t it great that I have it locked and loaded and I am ready to jump in.